30 years is a long time. 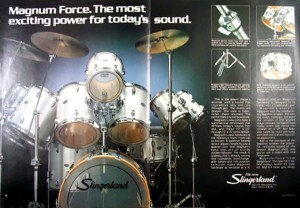 For my high school graduation, I was given a 7 piece Slingerland Magnum Force drum set. Pretty cool stuff at the time. Because it was a gift I didn’t have input as to the features it came with so unfortunately, the toms came single headed. They are heavy, three ply maple shells, but without the bottom heads, they just couldn’t produce the overtones and timbre of standard drum set toms. Result: they have a concert tom sound. They are very resonate drums however and I’m considering restoring them. Because it will be costly and time consuming I’m publicly blogging the entire project and collecting as much information from readers as possible. This is the original promotional poster for the Magnum series. It’s possible what I have is something different than what I thought I had. The posted image is what I thought I was getting in 1983, however, what I got didn’t look exactly like this. There are similarities and after 30 years, perhaps, it’s not really that important. John Kinane is a resident of Hilton, New York, a suburb of Rochester, New York. A former middle school band director and music teacher, John changed direction into technology and web and multimedia programming. He holds a Bachelors degree from the Crane School of Music and a Masters degree from Nazareth College of Rochester. Interests include percussion, drum and bugle corps, progressive politics, astronomy, web programming and raising three great kids. Can you retrofit a bottom head? I would also need to have the bottom bearing edges of the shell cut, with some level of precision actually. Not sure I’m going to do this now or not. I’ve been looking at a new Gretsch set for awhile now. JohnKinane.com is licensed under a Creative Commons Attribution-Noncommercial-No Derivative Works 3.0 United States License.